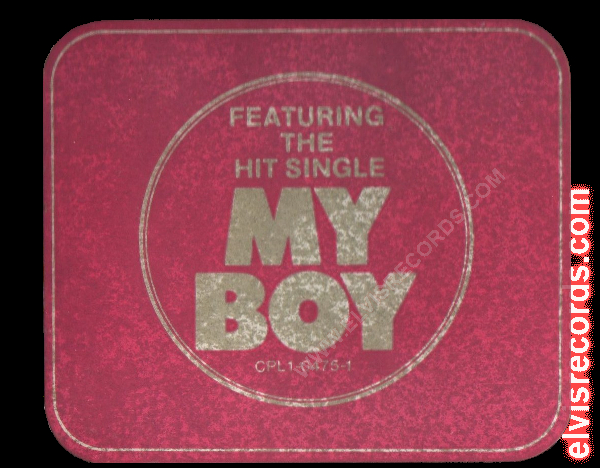 It has long been understood that the My Boy sticker on CPL1-0475 Good Times is rare. However, isn't understood, at least by me, when this sticker was applied to the record. It is also understood that the My Boy / Loving Arms release is considered rare and released in 1974. Once again, the question is when in 1974? February 9, 1974 RCA Victor APB0-0196 Take Good Care Of Her / I've Got A Thing About You (45) USA charts on Billboard, peaks at number 39, and charts for 12 weeks, where Take Good Care of Her charts for only 7 weeks. March 1974 RCA Victor CPL1-0475 Good Times (LP) Sticker CPL1-0475 Contains the Smash Hits: "I've Got a Thing About You" and "Take Good Care of Her"
April 6, 1974 RCA Victor CPL1-0475 Good Times (LP) USA charts on Billboard, peaks at number 90 on May 4, and charts for 8 weeks. January 25, 1975 RCA Victor PB-10191 My Boy / Thinking About You (45) USA charts on Billboard, peaks at number 20, and charts for 11 weeks. RCA Victor CPL1-0475 Good Times (LP) Sticker CPL1-0475-1 Featuring the Hit Single "My Boy"
From this table, I have drawn a few conclusions. The following is purely my speculation as I wanted to make sense of the My Boy sticker and the RCA-2458 EX release. Speculation 1: The CPL1-0475-1 sticker was produced during the time that the RCA-2458 EX (where EX is for export) was produced. Although the coal strikes and energy crisis had long been resolved, the residual fallout from those continued to remain. My Boy charted in late November 1974 on the UK charts with the flipside being Loving Arms. Both songs are from the Good Times album. Each song is track two on each side of the album. 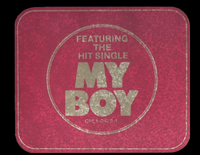 The song, My Boy, was very successful, peaking at number 5 on the UK charts1. Speculation 2: It was during this run of several consecutive weeks where My Boy charted in the top 10, where RCA exported product to support the demand in UK. Since the Good Times album was a charting disaster peaking at only number 90 on May 4, 1974, and the song My Boy was a huge commercial success in the UK, on January 4, 1975 RCA releases My Boy in the USA with the flip song Thinking About You. This song was chosen from the forthcoming release on January 8, 1975 of the album Promised Land. Which would be a logical tie-in which may fuel the sales of the single, Promised Land, and generate some interest in the Good Times album. Speculation 3: To support the above two speculations, it would be logical to suggest that My Boy / Loving Arms was likely released in December 1974 or January 1975. It would also be logical to suggest that the export release of My Boy / Loving Arms, the US release of My Boy / Thinking About You, and the push of old stock of CPL1-0475 Good Times with a new sticker announcing My Boy were all produced simultanesouly. This would explain one other point. The reason Good Times does not exist with a tan label and Promsed Land does.